Navigating a Canvas course as an observer is simple. Observers can view Global Navigation, Course Navigation, Breadcrumb Navigation, Sidebar, and Help link. The Global Navigation helps you get to where you want to go across all of your Canvas courses . The Course Navigation helps you get to where you want to go within your canvas course . 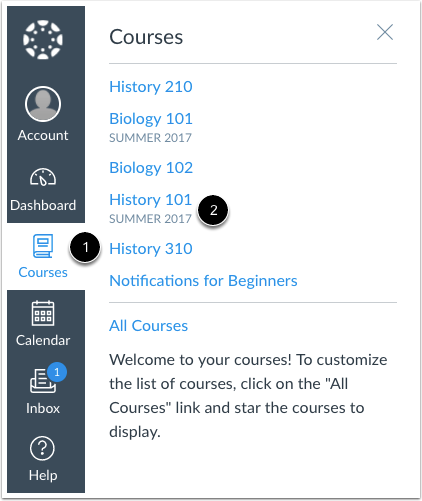 The Breadcrumb Navigation shows you where you have navigated to inside of a course and gives you a quick and easy way to move backward . The Sidebar will be mostly empty for Observers, but will come in handy when its time to edit a course Page . The Help link is very important. When you need assistance from your instructor or the Canvas Support Team, click the Help link . If you ever have trouble in Canvas and need to communicate with the Instructor about what you are looking at, use these terms and he or she will understand exactly what you mean. Previous Topic:How do I join a conference in a course as an observer? Next Topic:How do I view my user files as an observer? Table of Contents > Course Navigation > How do I navigate a Canvas course as an observer?